I spared this book. Had it in my shelf for quite some time after I started becoming a yachtmaster because it had something special about it. 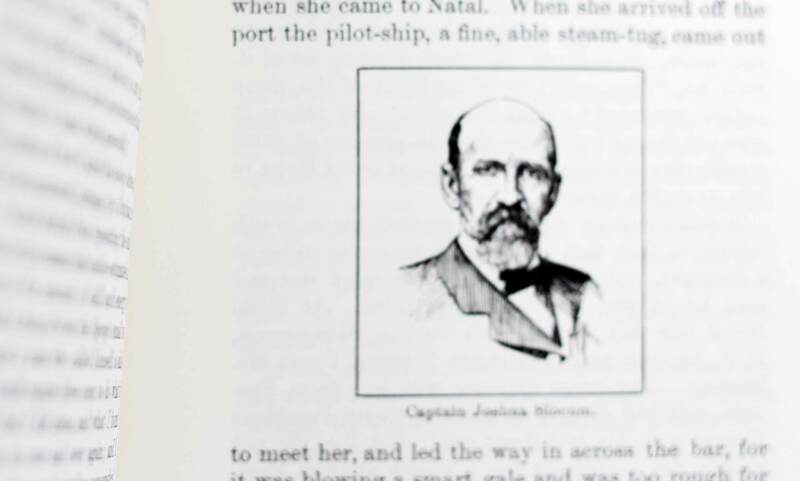 “Sailing Alone around the World” by Captain Joshua Slocum is often mentioned by sailing aficionados and skippers as one of the most influential maritime literature – if not THE mother of all books about circumnavigation. Captain Slocum – our Hero – was well in his 50ies when he set Sails. So, just having started with sailing by myself I wanted to have the book read in a moment when I would have gotten myself up the ladder a bit more. As a freshman aboard or a true lubber in the first place it felt kind of impudent to roam through these kind of sacred pages. Now that I´ve made my first yachtmaster´s certifications and got my first miles offshore sailing experience it was time to finally flip this classic. Here is what I think of his book. This book has been written by Captain Slocum right after his trip around the world and has been first published in the year 1900. 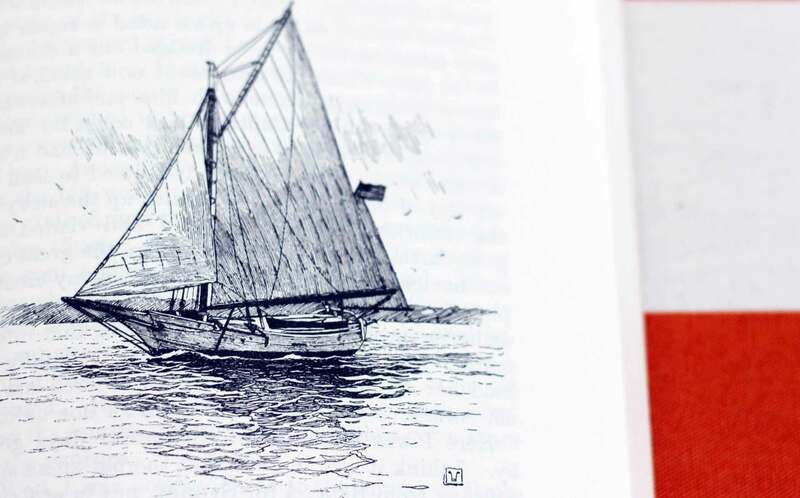 It was a success right from the beginning and has been reprinted since then in manifold versions and is still one of the biggest sailing literature classics to be read. In many schools – especially in the U.S. – this book is among the set books to be read by each and every pupil mandatory. The famous SPRAY of Boston: She´s the true Hero of the Book. “Sailing Alone Around the World” comprises some 300 pages of written words, the version I bought is a 1956 version printed by Dover Publications of New York City bought as an antique book: I just wanted to have this great smell of an old book which really suited the overall reading experience so well. After reading though within 2 weeks I can state: This some 116 years old book is still a great pleasure to read, Slocum´s adventure most admirable and it´s definitely a book worth reading. Truly, a must have in a sailor´s library and the shelves of everybody who loves to read a great maritime story. Simply told: Joshua Slocum is the first one ever to circumvent the globe in a yacht alone. His journey starts by weighing anchor at Fairhaven/New Bedford in 1895 and returns to the very same place some 46.000 miles and a little over 3 years later. By crossing the Atlantic first to Gibraltar, back to South America, round the Horn, through the Pacific, Torres Strait, Indian Ocean with rounding Cape of Good Hope he then returns by way of the Caribbean to the United States. As I said: All alone in his 34 feet Sloop SPRAY. I particularly liked all the nice illustration of Captain Slocum´s Journey. What struck me most was the fact that back in those times yachtsmen haven´t been so uncommon – having thought that this kind of spending leisure time is an invention of modern times. 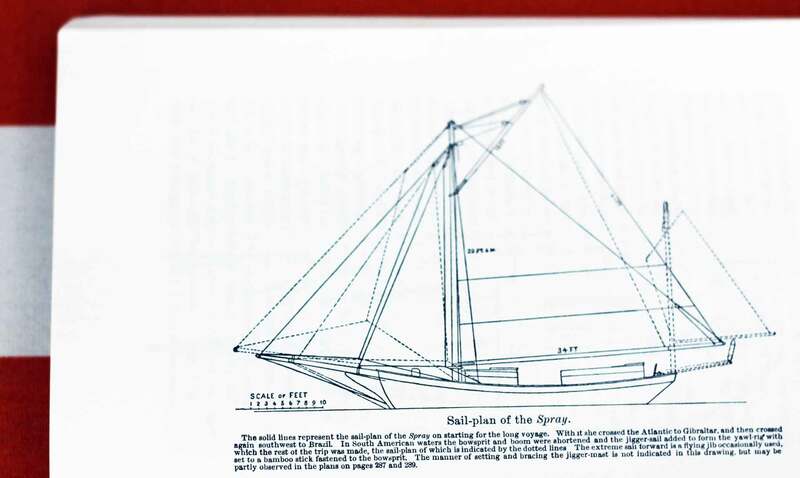 Captain Slocum was then an experienced seafarer in his 50ies as he set sail: As a matter of fact he could certainly afford to do so but again, I was puzzled to learn that yachting existed too back in those times. Slocum writes in a pleasurable style – his English doesn´t sound outdated yet some of his ways to express himself feel like taking the reader back in time. It´s a true pleasure to eat through the pages! It´s a light hearted style of writing, now and then peppered with anecdotes and jokes. 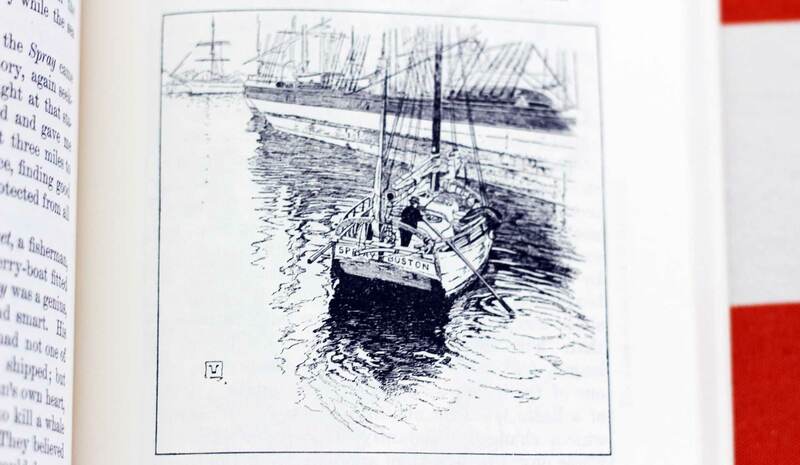 Apart from the fact that the reader learns so much about the way yachting has been 100 years ago it´s gripping to learn about the sheer ease with which Captain Slocum does navigate (no GPS, of course, but he even hasn´t got a chronometer and weathers storms, gales and the hazards of circumnavigation by way of boat. Which brings us to – from my point of view – the most gripping passage: His rounding of Cape Horn. 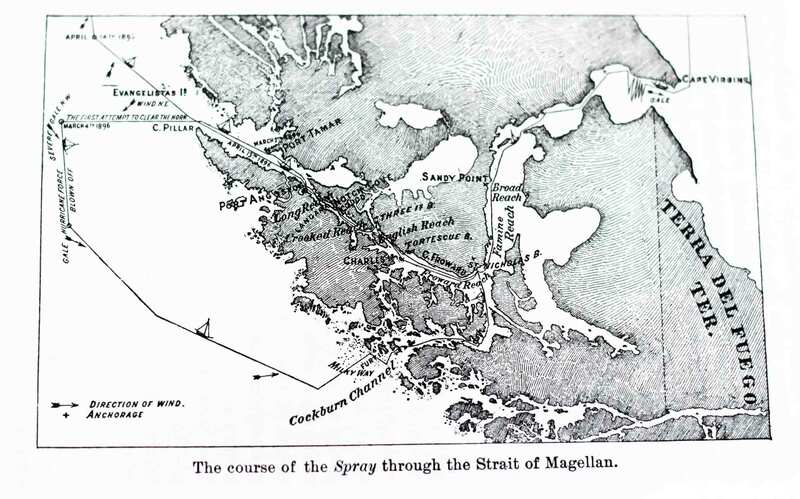 Sailing the Strait of Magellan: The best Chapter of the Book. I don´t want to spoil too much here, but this chapter – being one of the longest chapters of the book, meaning that Slocum himself seemed to assign this leg of his voyage some importance as well – is surprising, entertaining and teaching at once. The SPRAY won´t round the Horn by way of the famous Isla Hornos but by negotiating Magellan Strait. Here Slocum has to manage multiple encounters with the “Fuegians”, native Indians inhabiting this area. Saddled by the feared Williwaws, sudden Gales as well as being becalmed and being constantly on alert fighting the assaults of the Fuegians in their canoes was a whole new story to me – having only read the “ordinary” stories of rounding the Horn. This is totally different and truly gripping. What I really like about the book. And what not. I don’t want to exaggerate, but I do not just simply “like” this book, I can say I love it! It´s not just a time travel back into the “Golden Ages” of sail it´s more, in my view, a link from those times to modern yachting. More so, Slocum does imply a well-educated and wise look onto “his” world – offering a surprisingly honest and realistic view on modernity. He once states, for example, being in the South Sea enjoying the simple but true life of the Islanders of the Pacific, that “… white people only know Dollars. Only Dollars!” Commerce, greed, prejudice and this ill-fated struggle to accumulate material wealth is described by him with a sharp eye on the matter. There´s nothing, I would say, that makes this book not worth reading. No downsides: It´s a pleasurable reading because of the story itself, one learns a lot about sailing, the SPRAY and his contemplations of the different places where his Sloop anchored, his encounters with various people like Oom Kruger, the widow of Robert Louis Stevenson, Lord Milner and a huge variety of native born inhabitants make this book both a great sailing lesson and a historical account of a world long gone. Captain Joshua Slocum, the true American sailing hero, got missing at sea in 1909. I just read this book as well, pretty fantastic! It was clearly the wild west back then, fly by the seat of your pants type of living. Must have been a fantastic experience for him. this one really changed my life. It’s so much worth reading.